The artist had interested in computer graphics in the late 90s. It was a kind of return to photography. The first works made by means of a computer, in a sense, refer to the photomontages from the 50s. After decades, Beksinski again creates photographical compositions (collages) using his own and other's photographs. Yet, this time the photographs are inputted into a computer by means of a scanner then compiled and processed. Visions created in that way are similar to the painting works of the fantastic period in which dominate unrealistic, metaphysical space built through realistic chiaroscuro. The strongly transformed human figure or the head itself are the second leading motif, after the landscape, of the computer works. Far-reaching computer modification usually makes it impossible to identify the photographed model on the final photo. 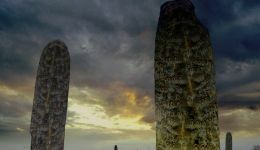 The best justification for the choice of artistic creation, which is computer graphics, are the words of the artist said in 1998 by himself: There is certain refreshment of mind in this work, the view from a totally different perspective than at painting. Playing with these programs, I can create artificial reality at any angle and figuratively ‘photographed’ it, which would be the final result of creation. Yet, that means of creating the composition became not enough for him after some time. Constantly insatiable need to seek new solutions and methods of their artistic execution prompted him to employ in his computer experiments the classical drawing being a starting point of subsequent computer modifications. The composition obtained in this way is so strongly transformed that as the whole it gives the impression of a hand drawing. In the modified drawings, in which the main motifs remain unchanged, predominate black and white works. 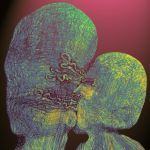 After few years, having bored with computer experiments and their limitations Beksiński got back to the previous means of artistic expression which was painting.